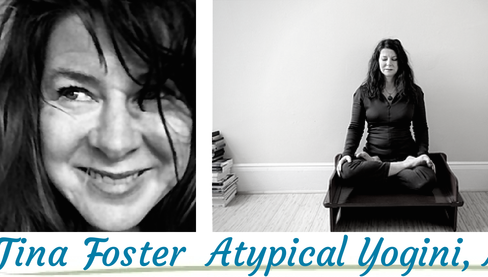 I don’t remember my reaction the first time I was labelled “Atypical” in the Yogini Category. I heard it often enough that it just stuck. I love it. Not out of deliberate contrarianism or the need to draw a line in the sand around myself. Beginning in the 1980’s, after 3 years of study with my first teacher, I practiced pretty much every day for almost 15 years totally alone- without any guidance whatsoever- not even a video or book, much less a teacher. Over time, I developed my own versions of certain postures as well as some new ones. A few postures were born bearing colorful and poetic names. I have my own version of Sun Salutations as well. I was fine with those I’d been taught. Yet, the new ones just unfolded through practice. Currently, I teach many of my own versions to others because time-testing has proven them to be safer, more meaningful and/or effective than their classical ancestors. I reluctantly accepted music in yoga classes, now I love it. But I make a lot of it myself. Those who show up for my classes deserve the best. Typical yogis talk about “light” and radiance. So do I. We are made of light. But I also respect the darkness, shadows and the underworld of Self. Love it or fear it, it’s there, it’s ALSO YOU, the most ancient traditions respected it. The shadow, the yin, the Underworld has secrets that can set you free or bind you forever, depending on how you work with it. And it is work. Getting over fear is always work. If light is our heavenly side, then darkness is our earthly side, our body and humanness. The depths of Soul. Where the blues come from. Where the grounding truths are rooted. The Secrets of why we are here on Earth in this warm, vulnerable flesh. This body is a temple–at once sacred and profane. Life here on this planet is so temporary and mysterious. Savor it. Be here now. By the way, did you know there’s no word in Sanskrit for “evil”? Yep. I’ve a long fascination with this. Back to the shadow. Thank you Jung, for helping us find our way back to it. Staring down into the shadow just before plunging in, it looks like thick black ink.